You don’t know me. But I think I know about all I need to about you. On the surface, you seem innocent enough. Lots of pretty pictures and inspiration swirling around like so many feathery party garlands, all for the taking. Motivational quotes to help us be the people we imagine ourselves to be in our minds? Got it. Crafts to enrich our child’s young life experience? Check. Recipes that make us drool over their simplicity and perfection? Roger. In short, you’re too good to be true. It took Google .27 seconds to return about 40,600,000 results when I searched “pinterest fail”. I just lost something like 30 minutes clicking on a few dozen of those 40,600,000 results. Websites the likes of Pinstrocity, Epic Pinterest Fail, and Pintester would not be relevant if our attempts to recreate these pins were successful more than they failed. Those perfectly styled photos are just that….perfectly styled. They aren’t real life. Common sense says that if something is too good to be true, it probably isn’t true. So Pinterest, as easy as it is to buy into the idea of a picture perfect life being only a click away, I’m going to keep living the life that says sometimes you have to give up on the idea of perfect and get your hands covered in some chocolate. BAH Note: You don’t have to temper your chocolate but tempered chocolate will set up firm at room temperature and not need refrigeration. And if you have a food processor…there’s no reason not to temper it. 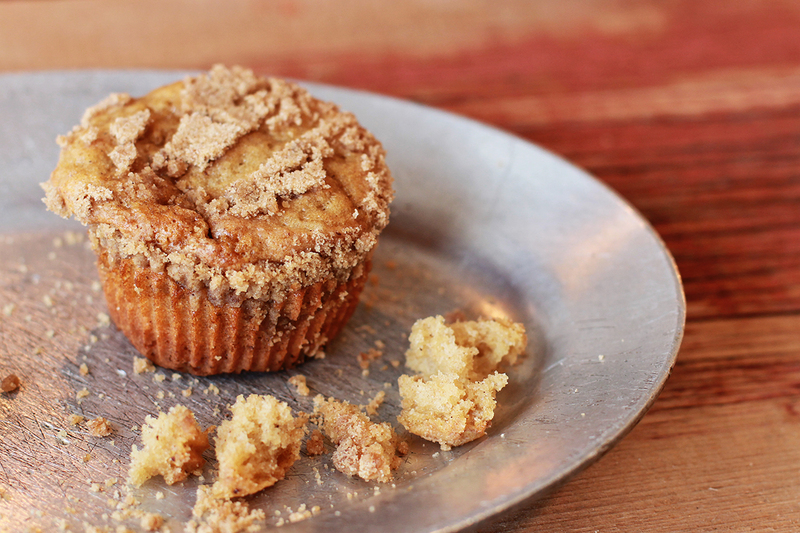 Top With Cinnamon will show you how. Clicky here for a lovely tutorial on the easiest method for tempering your chocolate. I found it annoying to separate the cookies and scrape the filling. Not to mention this resulted in lots of broken cookie bits that went into my mouth. Yes, the “thin” part of the title is achieved by separating the cookie but the goal of chocolate coated cookies is easier to achieve if you leave the cookies whole. You choose the approach you like best. Oh, and I eventually gave up on dipping the cookies in the chocolate and letting the excess drip off. My solution was to use a silicon pastry brush to slather a layer of chocolate coating all over the cookie. It didn’t result in as thick a layer of chocolate but it also didn’t make me cry in frustration. 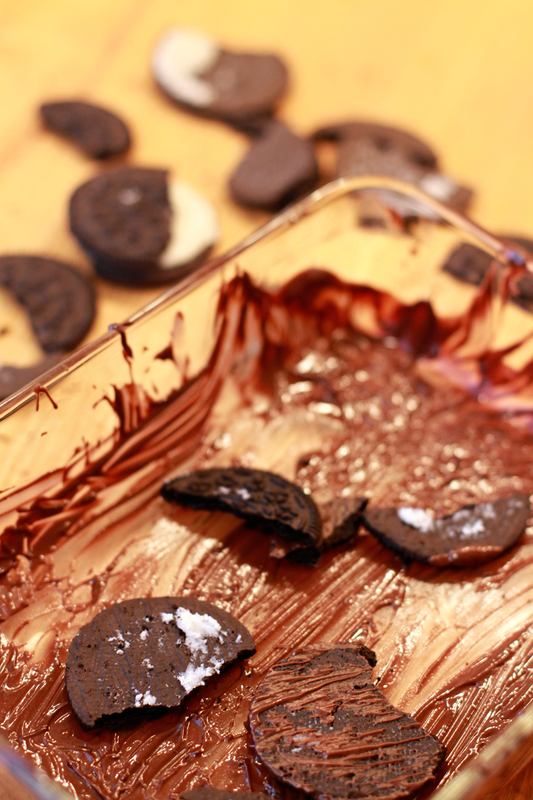 Separate the Oreo cookie halves, if you choose to. If using halves, scrape the cream filling off the cookies. 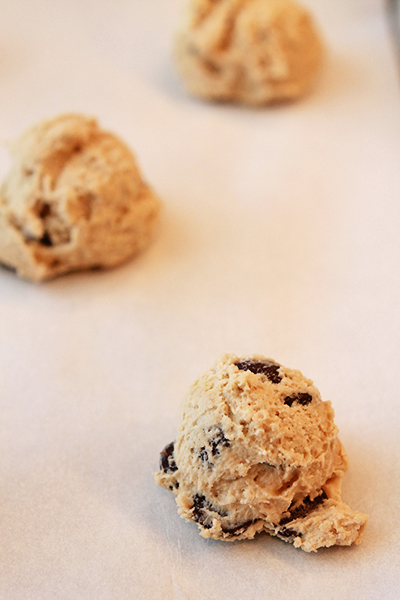 Place the cookies on one of the sheet pans. Melt and/or temper your chocolate. Add the mint extract and stir it into the chocolate. Dip the cookies into the melted chocolate using a fork (turning to coat both sides) or paint the cookies with the melted chocolate using a pastry brush. Transfer the coated cookies to the other cookie sheet. Allow the chocolate to set up (room temp for tempered or in the fridge for melted). Store cookies in an airtight container. I know that’s a helluva long title. But each and every word is important. Lemme break it down for you. Abby = Abby Dodge. Seriously credentialed baking guru. Author of multiple cookbooks, contributing editor to Fine Cooking, blogger, and teacher. If we were somehow plopped down in the middle of The Karate Kid, Abby would be Mr. Miyagi. She would be the sensei to my Daniel-san. I might also add that she is a lovely human being that I’ve had the pleasure of meeting. Do I sound like a fan-girl? Probably, and that’s ok. A girl has to have someone to admire. Greek Yogurt = low fat, tangy deliciousness. But let’s keep it real…the greek yogurt doesn’t make this a diet recipe. You’ve still got a whole stick of butter and more than one cup of sugar going into your batter. In the words of Mr. Miyagi, “You remember lesson about balance? Lesson not just karate only. Lesson for whole life. Whole life have a balance. Everything be better. Understand?” So yeah, some butter and sugar are ok. Just remember to look for some balance. Coffee Cake = snack cake perfection. Tender cake topped with buttery crumble. Perfect with a cup of coffee in the morning or as a late night snack. I’ve had a life long love affair with coffee cake thanks to the folks at Tastykake. They like to say that “nobody bakes a cake as tasty as a Tastykake”. I say maybe it’s time for a new slogan. Individually, these are three good things. Combined, they are a trifecta of perfect. They are Daniel-san seeing the wisdom in Mr. Myiagi’s teachings, winning the competition, and getting the girl….minus a soft rock soundtrack. *Note, all Karate Kid references are to the original 1984 movie. Why anyone would try to fix what wasn’t broken, I don’t understand. BAH Note: I think the only thing I would do differently in the future is to double the amount of topping and stir some into the batter. The topping is my favorite part of coffee cake, so I will always looks for ways to get more of it in my mouth. Combine the sugar, flour, and cinnamon for the topping in a small bowl. Stir in the melted butter until you get smallish crumbs. 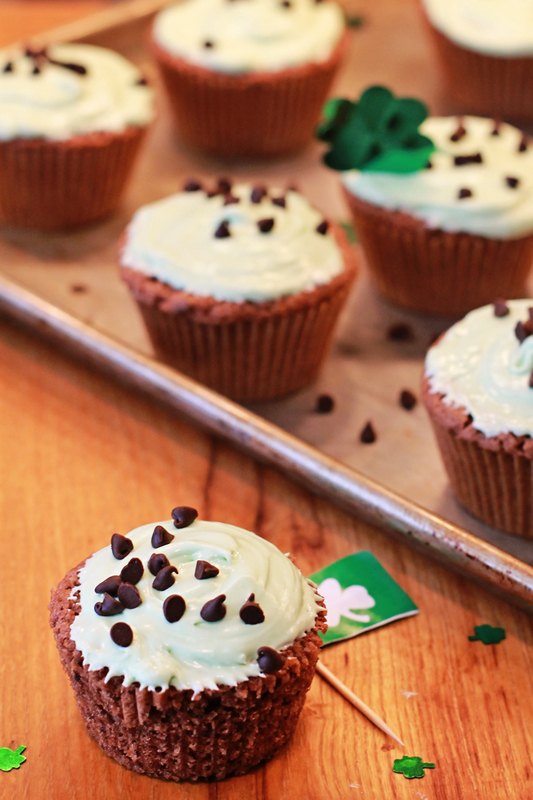 Transfer the topping to the fridge while you make the cakes. Heat the oven to 350 and line 16 muffin cups with baking papers. Whisk together the flour, baking soda, cinnamon, nutmeg, and salt in a medium bowl. In the workbowl of a stand mixer fitted with a paddle attachment, beat the butter for approximately 1 minute. Add the brown sugar and beat on medium-high speed for 2 minutes or until nicely creamed. Add the eggs, one at a time, beating well after each addition and stopping to scrape down the bowl as necessary. Add half of the flour mixture and stir on low speed until just combined. Stir in the yogurt and vanilla and mix until just blended. Fold in the rest of the flour mixture with a rubber spatula. Spoon the batter into the prepared muffin cups. Add the chilled topping and use the back of a spoon to gently press the topping into the batter (and then set that spoon aside for your enjoyment). Bake for approximately 18 to 20 minutes or until a tester comes out clean and the cakes spring back when lightly pressed. Transfer to a rack to cool completely…or just long enough so that you don’t scorch the top of your mouth as you cram some coffee cake goodness in your face. Once upon a time, I tried some Black Cherry Ice Cream. It tasted like dish soap. I told this story to my pal Mary while we were out picking sweet cherries earlier this summer. And I swear, later that very same day I got an email asking if I’d like to try Graeter’s newest flavor….Black Cherry Chocolate Chip. For a refresher on Graeter’s, clicky here please. Clearly, I took this as a sign that The Universe was listening to me say how awful I thought Black Cherry anything was and wanted me to reconsider my opinion. And thanks to the magic of dry ice, insulated packing, and overnight delivery, I had a change of heart. 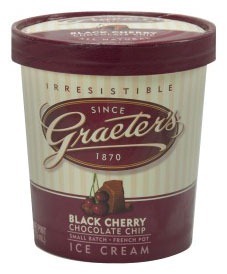 “Graeter’s ice cream is making 2013 a little sweeter with the addition of its newest flavor, Black Cherry Chocolate Chip. The new flavor is now available in The Fresh Market, Weis and Mars stores in the Baltimore area. The first new Graeter’s flavor in 3 years, Black Cherry Chocolate Chip, is all-natural black cherry ice cream made with heavy cream, pure cane sugar and loaded with fresh black cherries and Graeter’s signature dark chocolate chunks. Done the Graeter’s way, velvet smooth ice cream is studded with tender black cherries and chocolate. I’m not talking about a fleck of cherry or a chip of chocolate. Oh no. I mean full on cherries and Graeter’s signature chunks of chocolate that are magically married to the ice cream as it churns in its happy little French Pot (am I the only one that misses Bob Ross talking about happy little trees?). As a former Black Cherry hater I do not say this lightly, but this might be my new favorite ice cream flavor. Thank you Graeter’s for the opportunity to make a new start with Black Cherry Chocolate Chip. Finding out I was wrong has never been more delicious. Don’t have access to Graeter’s where you live? They will conveniently deliver it to your door. Disclaimer: I received complimentary ice cream from Graeter’s. All opinions expressed are my own. I went from being Type A to Type Meh in the span of just a few years. Type A = super competitive; anxious about everything being just so; rigid and uptight. Type Meh = more relaxed; content with things as they are or as they need to be; limber and fluid. I see this change to varying degrees across the different parts of me. But I think the change has maybe been most profound in the kitchen. For example, Type A me would have read Sweetened With Honey’s recipe for Campfire Bars and been all kinds of fired up to make homemade graham crackers and marshmallow and then morph them into a fireless s’more. Hell, I might have even flirted with the idea of processing my own chocolate….not really, or at least not seriously. Type Meh me read the recipe and immediately discounted the notion of making graham crackers or marshmallow. There are perfectly fine graham crackers and marshmallow at that big store with all the food so conveniently laid out for me. The time and effort I would invest into those projects could be better used stealing a nap on a weekend afternoon, sweeping under the sofa for small wooden toys deposited by Hurricane Libby, or being defeated by Level 29 in Candy Crush. My point is that unless I specifically want to be challenged by a recipe, as in Ken’s Ginger Cream Cake, I’m going to look for ways to simplify a fussy recipe to make it fit into the limited amount of time and attention that I can offer. What is the take away from this? 1) Not everything in life has to be a big production. 2) Even the smallest treats can be semi-homemade and full of love. 3) I like to nap. BAH Note: Since this is a Type Meh recipe, there are no exact measurements for anything on this one. Take a leap and trust your own judgment. Combine marshmallow fluff with some powdered sugar in a bowl and beat to combine with a mixer. Add additional powdered sugar until the fluff has thickened up to a frosting consistency. It should be sturdy but not stiff. Place half of your graham crackers on a sheet pan or cookie sheet lined with parchment (for easier cleanup). Top each cracker with a dollop of the fluff. Top with a second cracker and transfer the pan to the freezer for approximately 30 minutes. While the bars chill in the freezer, melt the chocolate and allow it to cool. Dip each bar in the melted chocolate or use a pastry brush to paint the chocolate onto the bars. Return the pan to the freezer for the chocolate to set. 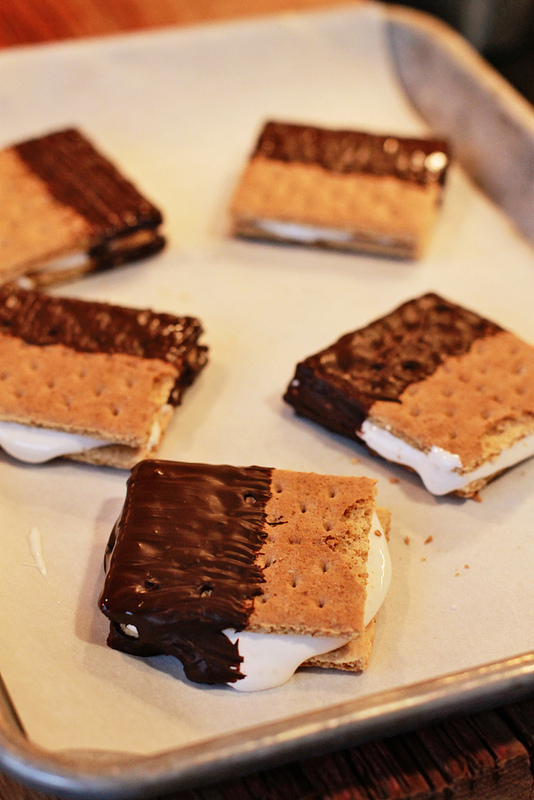 Allow the s’mores to sit out for a few minutes before serving to soften just a bit. 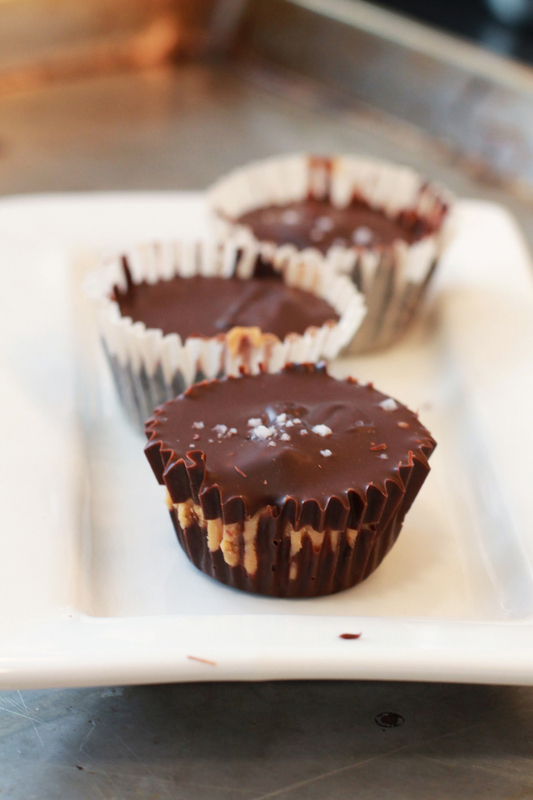 To satisfy your own curiosity, you can check out this post on Sprouted Kitchen…it’s the recipe I worked from. Now if you’ll excuse me, I have Very Special Birthday Party to start fretting over since I failed to make arrangements with the Birthday Party Fairy.